Have a conversation with the author, Maria Dismondy, via a simulcast (date TBD) and she will answer questions! Your class must have a reservation to the live show in order to participate in simulcast. "Lucy Lucy eats stinky food that puts us all in a big bad mood!” How can Ralph be so mean Lucy wonders? Lucy is one of a kind and Ralph loves to point that out. Lucy’s defining moment comes when Ralph truly needs her help. Because she knows what she stands for Lucy has the courage to make the right choice. 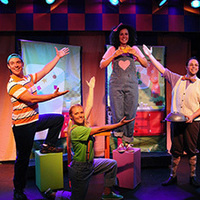 This tasty new musical based on the award-winning book by Maria Dismondy empowers children when faced with bullying to always do the right thing and to be proud of themselves. Contact Arts on Stage for Tickets at 410-252-8717 or artsonstage@artsonstage.org. Seating 995 in a continental pattern that affords an excellent view of the stage from any seat in the house. No gum, food or drinks are allowed in the auditorium. Photography of any kind is prohibited. There are no lunch facilities available. No picnic lunches allowed on the grounds.